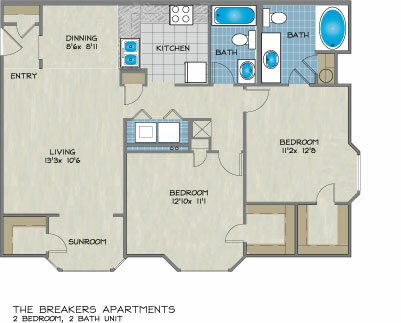 Please send me more information about Breakers Apartments. Here at The Breakers you can take full advantage of a peaceful Metairie, LA apartment community in a wonderful location that has controlled access gates, easy access to downtown New Orleans, Metairie Business District, the New Orleans lakefront, the University of New Orleans, Lakeside shopping center, great dining destinations and more. With The Breakers' apartments in Metairie, LA, you will get beautiful new garden apartment homes that offer many features found in single family homes. Also, The Breakers provides residents the full advantages of a maintenance-free lifestyle in a serene, park-like environment with an inviting gazebo and a beautifully landscaped courtyard. The on-site management and maintenance team attends to every single detail. 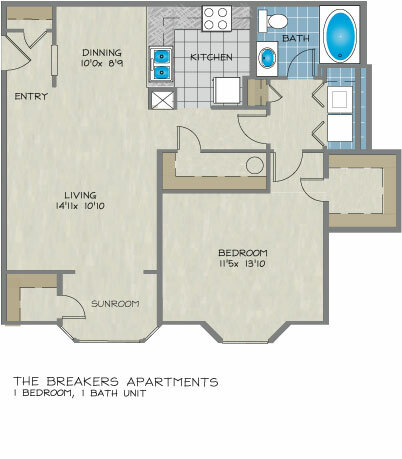 If you're looking for more than just an apartment for rent in Metairie, come and discover The Breakers. If you want a gated community, don't bother living here. The gates have been open since June 2015 because of construction. However, construction has been done for months, and yet, they stay open. As of January, the gates were supposed to be closed. Hah! They are still open. Of course, there has been no reduction in monthly rent even though we are paying for a "gated" community. The apartment complex is beautifully landscaped and always maintained. The complex is also gated and well lit. The apartments have a nice floor plan with spacious closets. I would definitley recommend this apartment complex. Great place to live! Staff is friendly and helpful. 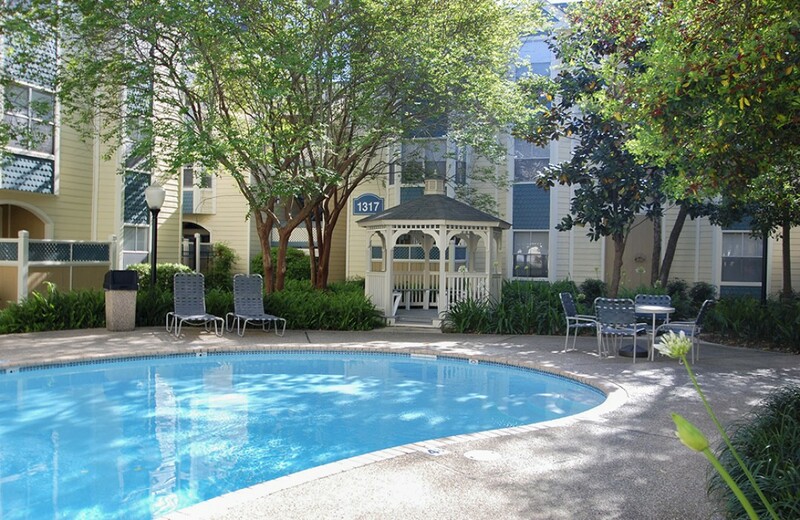 Convenient location, spacious apartments, well maintained inside & out. I had to move to the New Orleans area within two week of accepting a new job. After searching in the city and finding nothing that felt safe, I stumbled upon Breakers. I wasn't able to visit the property, but the friendly staff and amenities swayed me that this is the place I should be. While I was initially concerned about my commute, it turned out to be close to everything without the headaches of living in the city. It is a very quiet community and area. #A207. We have been living in the Breakers apartment complex since 2011. The complex is very nice, clean, and secure. The location is perfect: not far from New Orleans, Lake Pontchartrain, City Park. The staff is friendly and very responsive: whenever we had a problem, it would be fixed promptly. Our unit is big, 2bd/2bth with a washer and dryer inside and a lot of closets. We like living here and would recommend it to our friends. This is the perfect apartment complex. I live in a one bedroom, and it is huge with more than enough closet space. It also comes with regular sized washer and dryer machine. The complex also has a security gate, which is an added bonus. I definitely recommend living here! I've been living her for about a year and have had no issues. Every maintenance request has been attended to quickly and they listen to other feedback given. Every time I enter the office the staff is professional and friendly. The helped us out tremendously when getting into the apartment. The grounds are always kept neat and manicured. I've had no problems with neighbors, everyone is nice and theirs only a few of us in the building. The pool is a lovely bonus. 307-I've loved living here for almost a year! The staff is professional and nice, the grounds are kept neat and beatiful and the apartments are spacious. Having the security gate is a great bonus. The neighbors are nice and quiet, no problems there. They respond quickly to your requests and are open to suggestions for how to make living there better. The location is nice; not to far into Metairie close the Lakefront and downtown. This is such a great place to live!! The office staff & the maintenance workers will always help you no matter what the situation is. This is my first appartment & I absolutely LOVE living here! You can't go wrong if you decide to choose the breakers!!! The Breakers is one of the nicest complexes in the city and conveniently located near stores, restaurants and malls in Metairie and New Orleans. It is very small and quiet, clean and nicely landscaped. The grounds are well lit by bright lamp posts as well as bright lights by the entrances to each apartment. It is also a gated community for added safety. Even though tenants do not have assigned spaces for parking, it isn't a problem. The rooms and closets in the apartments are very spacious. The staff members, both in the leasing office and maintenance, are very friendly and helpful. I just signed my 3rd lease in November. I love the Breakers. Location is perfect. Not too far in to Metairie where you have to constantly fight traffic, convenient to downtown New Orleans. The apartments are enormous with high ceilings. Washer, dryer and dishwasher in unit. Huge bathtub. Tons of closet space. The staff always responds quickly to any requests. They are all very friendly and go above and beyond! I made an appointment to view this community. The apartment was very spacious. Lots of closet space and it had washer dryer in which I was looking for. The only thing they had available was coming in 3weeks in which I was unable to hold off that long. I would have leased here for sure if they would have had something within my time frame of moving. The grounds were clean, they also offered access gates and a swimming pool. The leasing agent Lorraine was pleasant and knowledgeable regarding the area as well as other apartment communities around her. She kindly referred me to another 1stlake property where I also toured and actually rented. I just moved to Surfrider from out of state and so far so good. Everything in my apartment has been pleasant. The apartments are very clean and kept well. I love having a washer & dryer in my apartment such a convenience. The maintenance personnel are very fast. I had some very small minimal issues when I moved in however they came out the next day to fix them immediately. I would highly recommend the community to anyone of my friends or anyone looking to move into the area. 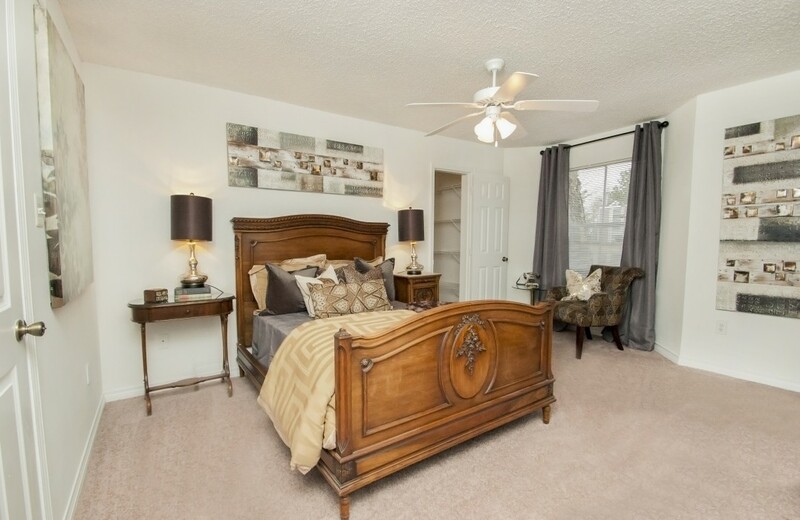 It is very close to shopping centers & easy access to the freeways. I've lived at the Breakers for a year and I love it! Anytime I needed anything the staff was right on it. The staff is A , friendly and professional. I would definitely recommend this as a place to move to for anyone. My husband and I have had such a wonderful time living here at The Breakers that we hate to move, but the time has come for us. The staff are always friendly and willing to help, and our neighbors are just fantastic. It's a small, quiet complex and it seems like most people keep to themselves. Although there were a few minor maintenance issues (during particularly heavy rains our roof had a leak! ), they were quickly corrected. All in all, a great place to live and we will miss it. I am writing this because of the 3 1/2 years i have been in the Surfrider Apartments and If I were not buying a new home I would spend the rest of my days here. What a wonderful group of Managers very thoughtful and pleasent tol talk to any issues that came up they were on top of it and it was taken care of. Any one in the Greater New Orleans looking of a great apartment and excellent Management this is the Place to live!